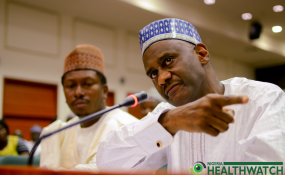 President Muhammadu Buhari has directed the embattled Executive Secretary of the National Health Insurance Scheme (NHIS), Usman Yusuf, to proceed on administrative leave effective from November 5. The directive was conveyed in a letter signed by the Secretary to the Government of the Federation, Boss Mustapha, on Wednesday. "This is to allow for unfettered investigation into allegations of infractions and financial malfeasance levelled against him by the Governing Council of the institution and other stakeholders", it noted. A seven-member panel has been constituted to probe the allegations against Mr Yusuf. The panel, headed by Hassan Bukar, has two weeks to submit its report. The panel's terms of reference include to investigate infractions alleged against the executive secretary and determine his culpability; identify, investigate and make recommendations on the issues that led to the frosty relations between the Governing Council and the ES; examine all governance challenges in NHIS and make appropriate recommendations among others. The formal inauguration of the panel is scheduled for November 5 in the office of the SGF. While the minister of health, Isaac Adewole, did not take calls to his phone for more information on the development, the chairperson of the agency's governing council, Enyantu Ifenne said she is yet to be briefed on the latest development.